All books have an aim. Sometimes the author clearly states the aim, sometimes they gradually find it. Regardless, the reader goes on a journey through the realisation of that aim. Whether it be to explore small town life through a love story or to solve a murder mystery where the detective holds an enticing secret, pulling off the aim gives the reader a sense of satisfaction. We’ve had our feed. Chevy Stevens’s Always Watching seems to set up about four or five different aims. At its centre though, the protagonist, psychiatrist Nadine Lavoie, experiences claustrophobia. Her efforts to uncover the trauma that caused her claustrophobia unleashes a tide of plot – a troubled, suicidal young woman; countless family dramas; a dangerous cult; a lost, drug-addicted daughter; god knows how many instances of sexual abuse; a dead husband; and a tonne of murders. When Nadine eventually finds herself cured of her phobia after a series of ridiculous plot twists, I had to wonder: was it really worth it? The problem with Always Watching is that it’s too ambitious. The crazy amount of aims can’t possibly be supported over a mere 338 pages. Not to say that the book ought to be longer. By the half way mark, it was difficult to retain any interest. Where is this going? I asked myself. Do I care? Although Always Watching is a thriller, its push into chick lit, action, and psychological drama weighs the book down. A thriller is focused and has suspense. A thriller is one of those books people stay up all night reading because they Have To Know what happens. Always Watching is just an explosion of prose. Francine, my dementia patient, wasn’t doing well on the unit, refusing to eat and trying to run away daily…We’d also had a young man admitted who tried to hang himself after losing his job and his girlfriend in the same week. Young men have a particularly difficult time with depression as they don’t have the emotional skills to work through it. Aside from the book’s other forays into a mix of genres, it also has ‘textbook’. Dramatic effect or bad prose? I’m not inclined to give Always Watching the benefit of the doubt. The initial premise that had me interested in the book was indicated the blurb which said that in her psychiatry work, Nadine encounters a patient who reminds her of her own life. The psychiatrist/patient relationship has been explored elsewhere, my favourite being in a work of creative non-fiction by Linda Whitcomb, titled “Three Spheres” (you can download a pdf of it here). The experience of being on both sides of the desk, as it were, explores the boundaries between being powerful and powerless. This is something Stevens fails to achieve and this narrative string is all but abandoned within the first 110 pages. I honestly don’t know who I would recommend this book to. If you like thrillers, it will be disappointing. If you like psychological drama, it will also be disappointing. If Goodreads reviews are anything to go by, some readers have enjoyed Always Watching very much. I just can’t ascertain why. 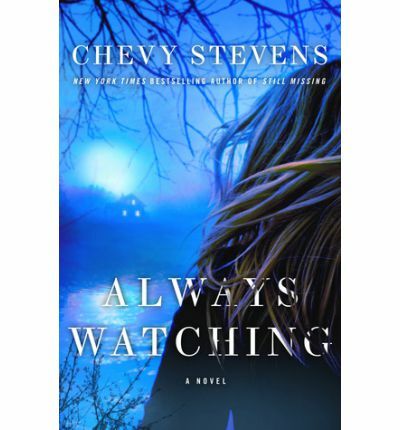 This entry was posted in Arts, Books and tagged always watching, book review, books, Chevy Stevens, drama, genre, lip lit, thriller. Bookmark the permalink.